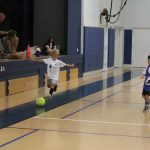 Autoway Ford in Division I and Division III Gettel Toyota are both sporting perfect 4-0 records at the halfway point of the Anna Maria Island Community Center soccer league season. While Gettel Toyota holds a comfortable 7-point lead in Division III, Autoway Ford has Wash Family Construction on its heels. Division II has Jen Crady Massage and LaPensee Plumbing tied for first with matching 3-1 records, but LaPensee defeated Jen Crady 4-2 Oct. 4 which could be a harbinger of things to come. Gettel showed why it’s the team to beat in Division III Oct. 5 when it rolled past Island Pest Control by a 5-1 score. Gettel wasted no time, scoring its first goal in the fourth minute when Daniel Sentman picked off a clearing pass at the top of the box and finished top shelf for a 1-0 Gettel lead. Sentman got into the scoring act again in the ninth minute when he took a pass from Ava Zink on the right wing. Sentman carried the ball into the box and ripped a rocket that Devin Calderon managed to block. But Sentman was there to knock in his own rebound to take a 2-0 lead. The Pests had a bit of bad luck in the 11th minute when a defender inadvertently handed the ball in the box. Daniel Fritz converted the resulting penalty kick for a 3-0 Gettel lead. IPC’s best scoring threat in the first half came in the 16th minute when Julius Petereit found some space up the right side. Defenders Charlotte Pardue and Emilee Bell forced him outside where his angle shot was easily covered by Gettel goalie Jack Barnes. Gettel notched another goal before the whistle, when Jack Groves picked off the goal kick and finished far post for a 4-0 halftime lead. IPC scored its lone goal in the 35th minute to make it 4-1. Gettel gained one more goal from Groves to complete the 5-1 victory. In other Division III action, Island Real Estate and West Coast Surf Shop battled to a 3-3 tie Oct. 4, while IRE battled The Feast to a 7-7 tie Oct. 1. The Feast notched a 3-1 victory over Island Pest Control Oct. 3 to complete the Division III game results. Jen Crady Massage won a pair of games last week, defeating Eat Here 5-2 Oct. 5 and 6-1 Oct. 1. In between on Oct. 4, they dropped a 4-2 decision to LaPensee. Sullivan Ferreira led LaPensee Plumbing with three goals while Jean-Paul Russo added one goal in the victory. Aiden Grumley and Trent Shackelford scored one goal each in the loss. The game of the week in Division I saw Wash Family Construction defeat Spinnakers Vacation Cottages 3-2 Oct. 7. Neil Carper led Wash with a pair of goals, while Nico Calleja added one goal. Henrik Hellem-Brusso led Spinnakers with two goals in the loss. Other Division I action saw Autoway Ford remain undefeated on an 8-2 victory over Mr. Bones Oct. 7. And Mr. Bones earned a 5-2 victory over Spinnakers Oct. 5 to round out Division I action. Ace Hardware again defeated Beach Bistro, this time by a 6-3 score. Jeremiah Goode scored five goals to lead Ace Hardware, which also received one goal from Chandler Hardy in the win. Tyler Marvin scored two goals to lead Bistro in the loss. Longboat Key resident Toni Teasdale and Barbara Smith of Bradenton captured a team pickleball gold medal in the 60-64 age group at the 2011 Tampa Bay Senior Games Oct. 5 in Sun City. Teasdale and Smith both play pickleball at the center and are fixtures in women’s doubles pickleball matches in seniors games up and down the west coast of Florida. Sato Real Estate, by virtue of a bye week, is the only remaining undefeated team in the center’s adult coed soccer division. Ross Built is tied for first place with Sato, but Ross is now 3-1, having dropped a 3-2 decision to Jessie’s Island Store Oct. 6. Jessie’s received single goals from Aaron Duduks, Anthony Rasulo and Sean Sanders in the victory. Eric Howe notched both goals for Ross Built in the loss. 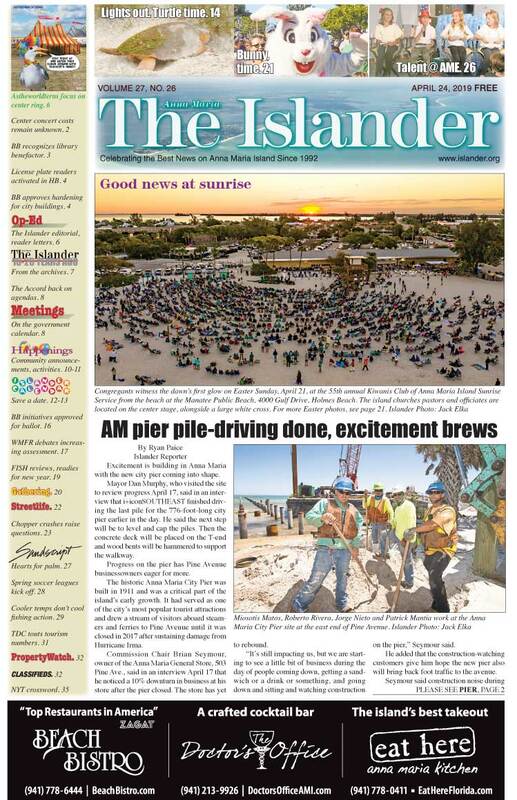 In other action, Island Pest Control improved to 2-2 with an 8-1 victory over Wash Family Construction. Don Meilner & Son Construction stayed within two points of first place with a 6-4 win over Euphemia Haye, and Florida Discount Sign earned its first win on the season with a 3-1 victory over West Coast Air Conditioning. Unique Mobile Detailing is undefeated at 4-0 and is a victory or two away from locking up top seed for the center’s adult basketball playoffs, which start Nov. 1. UMD rolled to a 52-32 victory over the winless Sun during action Oct. 4. Ryan Moss led a balanced scoring attack with 12 points, while Justin Jones finished with 10 points. Brent Moss, Jonathan Moss and Lindsey Weaver each finished with eight points in the victory. The Sun was led by Larry Berkery’s 13 points, while Chris Smith scored 9 points and Billy Malfese finished with 6 points in the loss. In other roundball action, Beach to Bay Construction evened its 2-2 record with a 65-58 victory over Agnelli Pool & Spas. Bowes Imaging also got back to the .500 mark with a close 61-60 win over Southern Greens. Two teams emerged from pool play during Oct. 8 horseshoe games at the Anna Maria City Hall pits. Jeff Moore and Sam Samuels defeated Larry Livrago and Jerry Disbrow by a 22-16 score in the finals. Jerry Disbrow and Sam Samuels defeated Norm Good and Bob Heigher 21-15 to earn bragging rights for the Oct. 5 games. Meantime, Ron Pepka, the long-time horseshoe pitcher and organizer is scheduled for open-heart surgery. His horseshoe playing buddies and the staff at The Islander wish him well. Teams W L T Pts. Oct. 18 6 p.m. The Feast vs. Isl. Real Est.